With bed and breakfasts from the 18th, 19th and 20th Centuries, the County of Bath offers more diverse historical settings than most. The Hot Springs Victorian Inn even has a “Honeymoon Suite” to make for the ideal Virginia style honeymoon bed and breakfast, and the Fort Lewis Lodge hosts 3 bedrooms from a renovated silo attached to the lodge which makes the rooms round. Still looking for something different? 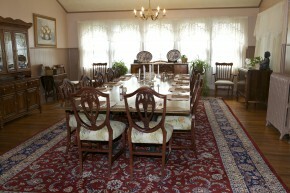 Warm Springs residents can eat in a well-preserved 19th Century courtroom along with the judge’s chambers. Imagine life at a country estate in the 1920’s and 1930’s. At Garth Newel Music Center in Hot Springs, music is the key that unlocks a world of experience. From classical to jazz and more, inspired music-making is just the beginning of all that the Center provides. 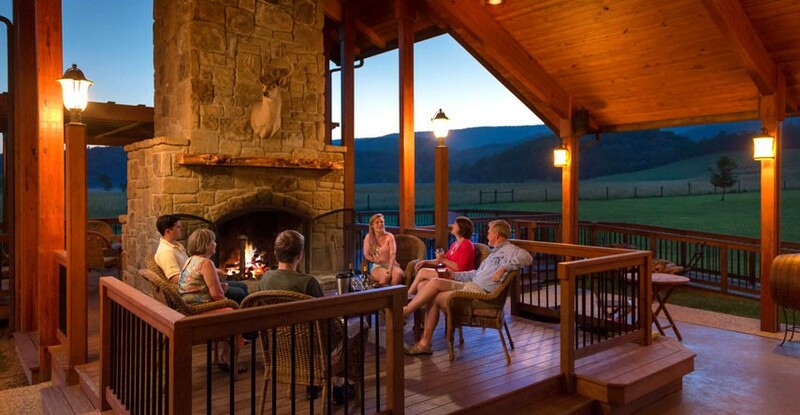 Gourmet meals, the exquisite Bath County landscape, and some of the most interesting people you will ever meet make each visit a one-of-a-kind experience. Spend the weekend in this magical place built by the American artist, William Sergeant Kendall and his young wife Christine Herter Kendall. 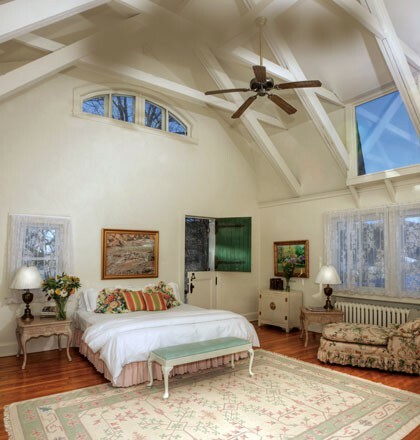 Browse their library, stay in one of the guest rooms and see where the Kendalls painted. Schedule a tour of the estate with one of our volunteers, explore and lose yourself in the breathtaking beauty of the surrounding area. Take a short trip to the Jefferson Pools to take the waters or take advantage of the great outdoors! Our Manor House, one of the two buildings on our property registered as an Historic Landmark, is tastefully decorated and comfortable. On concert days, it is a short stroll to the Concert Hall. The Center also has two cottages available. As a weekend guest, life is casual here; check-in and check-out times are flexible. Continental-style breakfast is provided as you sink into your home away from home. Limited availability. Please call for more information. 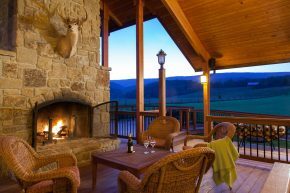 Discover your happily ever after at Garth Newel. Warwickton Mansion, a magnificent brick home built by James W. Warwick in 1851, is now home to the Hidden Valley Bed & Breakfast. The lush natural beauty of the George Washington National Forest provides a peaceful and secluded location for the mansion which is on National Register of Historic Places and is a Virginia Historic Landmark. During your stay you will enjoy mountain biking, hiking or birding on the local trails that ring the property. For fly-fishermen the Jackson River is just a cast away! 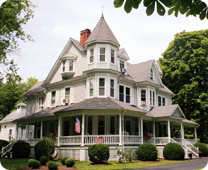 Lodging Offerings include: Warwick Manion offers three spacious bedrooms with private baths. Full breakfast is included in the rate. The mansion is furnished with beautiful period antiques. Wifi. Open seasonally. The Summer Kitchen, built for the movie Sommersby filmed on site in 1992, has two rental suites. The Kitchen sleeps four and is perfect for a small family or a group. Full kitchen, fire places, satellite TV, wifi and pet friendly. Open year round. The Quarters sleeps four and is perfect for a small family or a group. Full kitchen, fire place, satellite TV and wifi. Open year round. 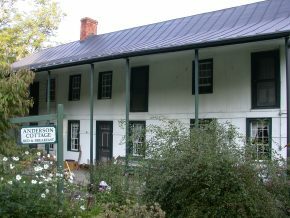 The Anderson Cottage has been welcoming guests in Warm Springs, Virginia since the 1790s, as a tavern, girls school, summer inn, and, for over thirty years, as a Bed and Breakfast. 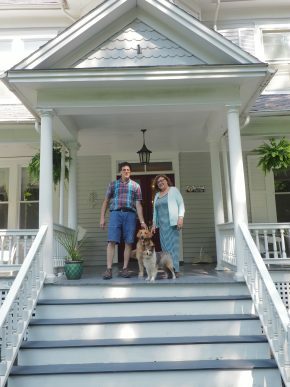 In this “wonderful old house” that has been in our family since the 1870s, we offer three suites and two bedrooms, plus a three-bedroom cottage by the stream. 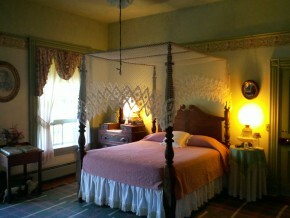 The main house has three suites and two guest bedrooms. A detached cottage, formerly the kitchen, has an additional three bedrooms. 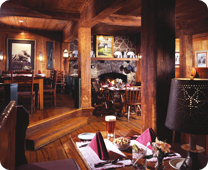 Breakfast is served in the large dining room, with an open fire on chilly days. Two acres of grounds feature lush green lawns, beautiful flower gardens, and a sparkling clear stream fed by the nearby warm spring. If you’re looking to relax, have a soak in the historic Jefferson Pools which are a short walk away, or pick out a book to read while resting in the hammock. Music lovers will enjoy concerts at the Garth Newel Music Conservatory which is less than 10 minutes away by car. Sportsmen and those with a love of the great outdoors will find themselves spoiled for choice! We are located at the doorstep of the George Washington National Forest, and a short drive away from the Jackson River, Lake Moomaw, and Douthat State Park. 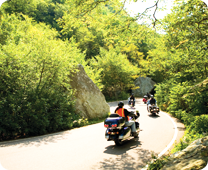 The area abounds in natural beauty, and there are miles of walking trails and scenic drives to be discovered in the Allegheny Highlands. The Inn at Gristmill Square is the ideal destination for rest and relaxation. Since 1771, there has been a mill in continuous operation on Warm Springs Run. 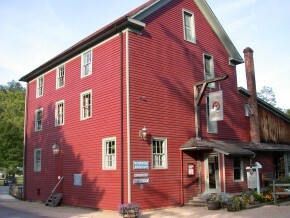 Today, the present mill building is home to the Waterwheel Restaurant,. The surrounding hardware store, blacksmith’s shop, and two turn of the century private residences make up the 17 quaint guestrooms forming what is now The Inn at Gristmill Square. These lovingly restored historic buildings offer unique guest rooms while still providing all the conveniences discerning travelers have come to expect. Each room has a private bath, flat screen television with satellite channels, complimentary high-speed wireless internet, a private phone line, and many other traditional amenities. Each of our seventeen guest rooms and suites are individually furnished and many have their own wood-burning fireplaces set and ready for you to light with the strike of a match. Across the grounds guests can find themselves at the Warm Spirit Spa offering massage and facial services. Dining at its finest can be found at the Waterwheel Restaurant, which is known throughout the area for delicious cuisine in a casual elegant setting with service that is unparalleled. The Inn at Warm Springs has been a landmark in Bath County since it was built in 1843—not as an Inn but as the first County Court House and Jail. Located directly across the road from the Jefferson Pools this charming bed and breakfast offers a host of amenities including private quarters each with private bath, satellite TV, free WiFi, ample free parking and breakfast in the atrium room. There are a variety of rooms from which to choose—but the most popular are those that have been transformed from jail cell to cozy, well-appointed sleeping rooms. Located near restaurants, shops, the Pools and the Garth Newel Music Center this historic Inn has been welcoming guests for over a century. Whether you are traveling alone, as a couple, with family or friends you will find this both an affordable and inviting place to stay. 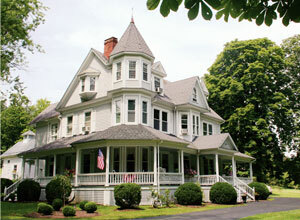 Vine Cottage Inn is a unique bed and breakfast with a true and welcoming country inn feel. 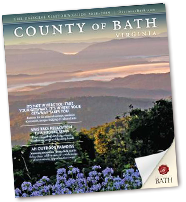 It is located in the village of Hot Springs, in the breathtaking Allegheny Highlands of Bath County, Virginia. Vine Cottage Inn has called Hot Springs home for 110 years, first opened its doors to visitors, travelers and guests in 1905. 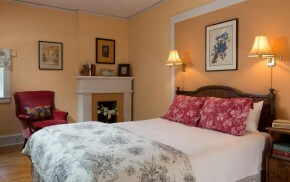 Vine Cottage Inn possesses a charm and simple elegance that embraces you. 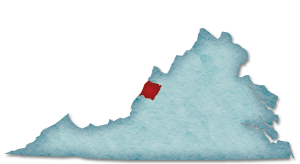 Situated one block from The Omni Homestead Resort, a world renowned resort and spa, . Vine Cottage Inn guests can benefit from many of the amenities The Omni Homestead Resort offers while staying in an affordable, “like home” environment.